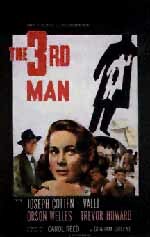 My film story, The Third Man, was never written to be read but only to be seen. The story, like many love affairs, started at a dinner table and continued with headaches in many places: Vienna, Ravello, London, Santa Monica. long before, on the flap of an envelope, I had written an opening paragraph: "I had paid my last farewell to Harry a week ago, when his coffin was lowered into the frozen February ground, so that it was with incredulity that I saw him pass by, without a sign of recognition, among the host of strangers in the Strand." I, like my hero, had not the least inkling of an explanation, so when Alexander Korda over dinner asked me to write a film for Carol Reed  to follow our Fallen Idol which I had adapted from my short story "The Basement Room" a year beforeI had nothing more to offer him except this paragraph, though what Korda really wanted was a film about the Four-Power occupation of Vienna. 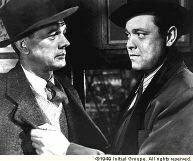 To the novelist, of course, his novel is the best he can do with a particular subject; he cannot help resenting many of the changes necessary for turning it into a film play; but The Third Man was never intended to be more than the raw material for a picture. The reader will notice many differences between the story and the film, and he should not imagine these changes were forced on an unwilling author: as likely as not they were suggested by the author. The film in fact is better than the story because it is in this case the finished state of the story. One of the few major disputes between Carol Reed and myself concerned the ending and he was proved triumphantly right. I held the view that an entertainment of this kind was too light an affair to carry the weight of an unhappy ending. Reed on his side felt that my ending  indeterminate as it was, with no words spoken, Holly joining the girl in silence and walking away with her from the cemetery where her lover Harry was buried  would strike the audience who had just seen Harry's death and burial as unpleasantly cynical. I was only half convinced: I was afraid few people would wait in their seats during the girl's long walk from the graveside towards Holly, and the others would leave the cinema under the impression that the ending was still going to be as conventional as my suggested ending of boy joining girl. I had not given enough credit to the mastery of Reed's direction, and at that stage, of course, we neither of us anticipated reed's discovery of Anton Karas, the zither player. All I had indicated in my treatment was a kind of signature tune connected with Lime.